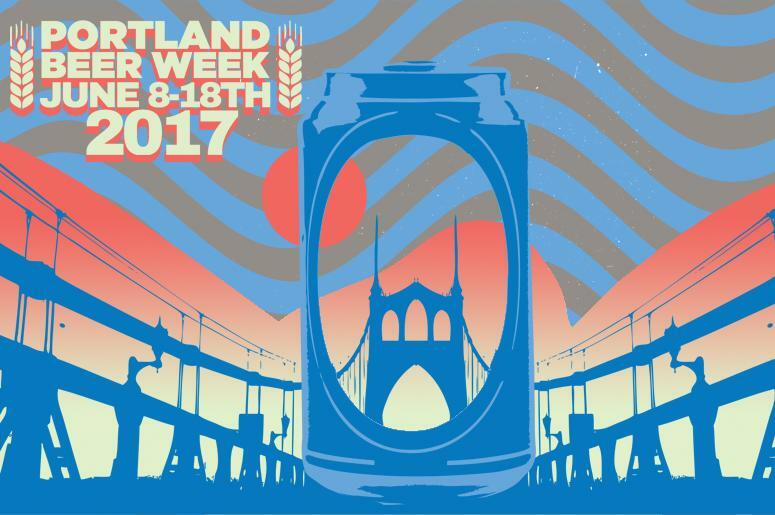 Portland Beer Week returns for 2017, its seventh year, with a veritable blitzkrieg of events, as well as some new twists. The 11-day fest runs June 8-18. It's coming up faster than you think. 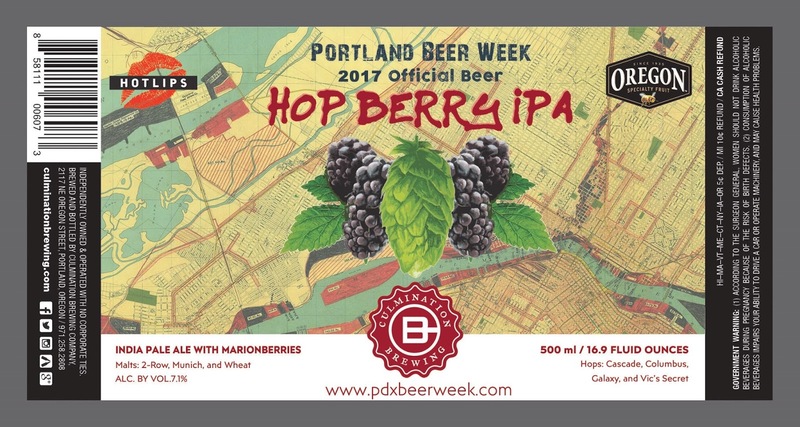 This year’s official beer is Hop Berry IPA, brewed with marionberries by Culmination Brewing. It will be available on draft and in limited edition bottles at Whole Foods Markets and other beer-centric retailers in the Portland area. Although beer is its main focus, Portland Beer Week extends that theme. It features numerous activities that happen alongside opportunities to enjoy great beer. The event is effectively a celebration of Portland’s beer, food and arts culture rolled into one. One of the big additions (actually an expansion, since there was a kickoff event last year) this year is the Kickoff Party on June 8th. There will be breweries, along with food and merchandise vendors. The party is being held in the Exchange Ballroom and on the Cascade Rooftop (top of the Exchange Building), which features spectacular views of the city. Another addition this year is the Dinner Series, which features a handful of collaborations between top local breweries and chefs. Organizers have built the schedule so they don’t have dinners piling up on the same date. “I’m looking forward to Firestone Walker at Hair of the Dog, Culmination Brewing at The Woodsman, Block 15 & Ruse at an Imperial Session pop-up dinner and Modern Times at Pizza Jerk,” Johnson-Greenough said. Returning this year is the Seminar Series, presented by Oregon State University and the HR Group. Several seminars will explore subjects like beer industry branding, starting and building a brewery from Nano to production, sustainability in brewing, barrel-aging beers and sour and wild ales. The beer event schedule jumps into action shortly after the Kickoff Party with the Fruit Beer Festival at Burnside Brewing, June 9-11. Billed as a premiere showcase for fruit beers, the event also features local vendors, food, DJ's and non-alcoholic drinks. It's the marquee event of Portland Beer Week. The Fruit Beer Fest and fruit beers, generally, have gained favor in recent times. It's a little perplexing because fruit beers run counter to tradition in this country, tradition being infested mainly with light beers made with malted grains. Fruit has been used since the Sumerians and Egyptians. As far as I know, every culture on earth has used fruit. Beer was, until fairly recently, a product of the farm, and farmers dumped whatever they had in it, including fruit. Medieval accounts list things like tree bark, hen bane, eggs, beans, honey, chimney soot and ashes as ingredients. Except for lager-brewers in Bavaria, basically no one in the history of civilization ever thought using just grain was somehow "proper." So what's happening in American craft beer is that we are expanding our tastes to include ingredients that have been used for centuries. The Fruit Beer Festival has helped with that. 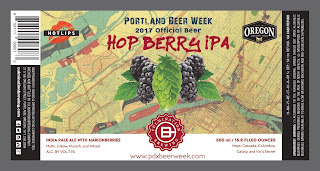 And, of course, the official Portland Beer Week beer, mentioned earlier, is made with fruit. Symmetry. The next big event of Portland Beer Week is Masters of IPA, an invitational showcasing America's best brewers of IPA's and hoppy beers. It moves to a larger venue with a curated selection, glassware and meet the brewers’ sessions on Friday, June 16th at Ecliptic Brewing. The annual Rye Beer Fest, in its sixth year, returns with a new date and venue, moving to the Happy Valley Station indoor/outdoor food cart pod and taproom on Saturday June 17th. The all-age fest will pour more than 20 rye beers and have 18 food carts. Portland Beer Week’s official finale, Snackdown, returns for a second year on Sunday, June 18th, noon to 4 p.m. Presented by Gigantic Brewing and taking place in The Evergreen ballroom above Loyal Legion, it features more brewer and chef pairings. Stalk Portland Beer Week’s social media channels on Twitter, Facebook and Instagram for updated news and information. Advance tickets for most events are available online.